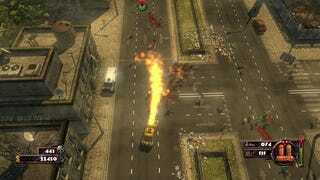 Independent Polish developer EXOR Studios proudly presents Zombie Driver, a PC game that combines the fun of driving through zombies with the joy of shooting them and setting them on fire, available today on Steam and GamersGate. Zombie Driver's name caught my eye, and then the gameplay trailer we posted in October took said eye out and played with it for awhile. Looking very much like an old-school Grand Theft Auto title, Zombie Driver sees players driving through an undead-infected city, plowing through hordes of zombies as they race to rescue survivors of the apocalypse. As you play you buy and unlock new cars, upgrading them with various implements of destruction, such as flamethrowers, rocket launchers, or dual railguns. EXOR could have very well just released a free-roaming zombie killing widget and I would have been completely satisfied, yet they've gone above and beyond, with 17 story missions with sub quests and bonus missions, just in case you get tired of mindlessly slaughtering the undead and wish to mindfully slaughter them. There's even a combo system to make the slaughter even more rewarding. GamersGate currently has the game available for $9.95, while steam is selling it for $8.99 for a limited time. That seems like a ridiculously low price. The game unlocks on Steam in a couple of hours, so check out the screens and trailer to see if they make your heart sing as much as they did mine.